E. P. Dutton & Co. - Metropolitan Opera Guild. Hardcover. POOR. Noticeably used book. Heavy wear to cover. Pages contain marginal notes, underlining, and or highlighting. Possible ex library copy, with all the markings/stickers of that library. Accessories such as CD, codes, toys, and dust jackets may not be included. Penguin Publishing Group, 1978. Hardcover. Good. Disclaimer:A copy that has been read, but remains in clean condition. All pages are intact, and the cover is intact. The spine may show signs of wear. Pages can include limited notes and highlighting, and the copy can include previous owner inscriptions. At ThriftBooks, our motto is: Read More, Spend Less.Dust jacket quality is not guaranteed. Penguin Publishing Group, 1978. Hardcover. Acceptable. Disclaimer:A readable copy. All pages are intact, and the cover is intact. Pages can include considerable notes-in pen or highlighter-but the notes cannot obscure the text. At ThriftBooks, our motto is: Read More, Spend Less.Dust jacket quality is not guaranteed. Penguin Publishing Group, 1978. Hardcover. Good. Disclaimer:A copy that has been read, but remains in clean condition. All pages are intact, and the cover is intact. The spine may show signs of wear. Pages can include limited notes and highlighting, and the copy can include previous owner inscriptions. An ex-library book and may have standard library stamps and/or stickers. The dust jacket is missing. At ThriftBooks, our motto is: Read More, Spend Less. E. P. Dutton & Co. - Metropolitan Opera Guild. Used - Acceptable. Former Library book. Shows definite wear, and perhaps considerable marking on inside. E. P. Dutton & Co. - Metropolitan Opera Guild. Used - Good. Shows some signs of wear, and may have some markings on the inside. E. P. Dutton & Co. - Metropolitan Opera Guild. Used - Good. Good condition. Acceptable dust jacket. Slightly dampstained. New York: E.P. Dutton. Good in Very Good dust jacket. 1978. First Edition. Hardcover. 0525229604 . 0525229604. .
E. P. Dutton & Co. - Metropolitan Opera Guild, 1978-11-30. Hardcover. Like New. NY: NY: E.P. Dutton & Co/Metropolitan Opera Guild, 1978, 1978. Book. Very Good +. Cloth. Stated First Edition. 8vo - over 7¾" - 9¾" tall. Cloth. Very Good +/No Jacket. Stated First Edition. 8vo - over 7¾" - 9¾" tall. 181 pp. on coated stock. Numerous b&w and color photos. Very clean and lightly read, small brownish smudge, perhaps a crayon mark, on rear cover. Part of the Metropolitan Opera Guild Composer Series. 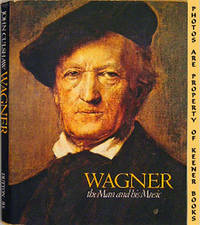 A pictorial biography of Wagner. With index and list of his opera premieres. Also an appendix on the Wagner repertory "Stories of the Opera." Includes many photos of famous singers performing his work. E. P. Dutton & Co. - Metropolitan Opera Guild, 1978-11-30. Hardcover. Good. E. P. Dutton & Co. - Metropolitan Opera Guild. Used - Very Good. Ships from the UK. Former Library book. Great condition for a used book! Minimal wear. 100% Money Back Guarantee. Your purchase also supports literacy charities. New York, New York: E. P. Dutton & Co. - Metropolitan Opera Guild. Very Good in Very Good Dust Jacket. 1978. First Edition: First Printing. Hard Cover. 0525229604 . 005895: Printing Number Line (10 9 8 7 6 5 4 3 2 1) . Scarce, Out Of Print, Book. Dustjacket now protected by a new Brodart Mylar Cover. "Presents a lively text and over 150 historic photographs and drawings - many in full color - to document the life and work of the master of Bayreuth. Also included in this brief but authoritative biography are the stories of each of Wagner's operas with notes on the casts and conductors of the world premieres and Metropolitan Opera premieres. ": 7.25 x 9 in. : 181 pages . New York: Dutton, 1978. Hardcover. Near Fine/Near Fine. First edition. Near fine in near fine dustwrapper. Pages clean with illustrations. Clean cloth cover. Spine ends lightly bumped. Dustwrapper price clipped. Dustwrapper covered in contact paper. Please Note: This book has been transferred to Between the Covers from another database and might not be described to our usual standards. Please inquire for more detailed condition information. E. P. Dutton & Co. - Metropolitan Opera Guild. Hardcover. 0525229604 Like New Condition. . Fine. 1978-05-01. Good. Ships with Tracking Number! INTERNATIONAL WORLDWIDE Shipping available. May not contain Access Codes or Supplements. May be ex-library. Shipping & Handling by region. Buy with confidence, excellent customer service! E. P. Dutton & Co. - Metropolitan Opera Guild. Hardcover. 0525229604 New Condition. . New.